Since group travel is on your list, Wink-Reisen is a German and family-owned motor coach tour company who has been sharing all European countries with travellers for more than 20 years! 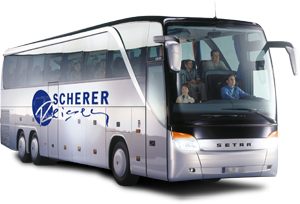 As one of a well-known and reputable inbound tour operators in Germany with a fleet of late model motor coaches of any size, we provide 20 up to about 70 most convenient seats. All of our late model motor coaches feature air-conditioning with adjustable individual air vents, a toilet/ washroom, comfortable reclining seats without intruding a passenger behind. A high quality sound system will deliver the commentary of your private Tour Director to every seat and large windows guarantee most beautiful views. Wink-Reisen also guarantees empty seats on each tour with the possibility to stretch out to a maximum of comfort while touring. With our head office in Bad Kreuznach, near Frankfurt and not far from Munich, Wink-Reisen offers a wide range of full travel service with a great deal of care. All of our itineraries offer a sensible balance of well organized sightseeing, leisure time and special treats. All package tours come all inclusive and are noted with no hidden charges to keep your customers cost down. You will also appreciate the convenience of a private English speaking Tour Director throughout land, that means no annoying announcements in several languages and no bilingual sightseeing. They are trained as professionals with expertise and an intimate knowledge of each region through which you are travelling and will be at your service 24-hours each day to make your tour perfect in every possible way. No matter - joining a leisure, special interest, incenctive or even a technical tour. We feel like that your client´s vacation is the most important time of the year to enjoy some of the best European places of timeless beauty, steeped in history and tradition - and of course with a maximum of enjoyment ! Yes, - all your payments are fully secured by a Customer Protection Plan in cooperation with one of Germany´s leading insurance companies, - because it´s a law in Germany! Please find some more details attached with this offer. So, why not choose one of our enclosed and well-organized and hussle-free all inclusive land tours. Select your own arrival and departure date in accordance with us and let your customers travel in style to enjoy a special vacation of scenic landscape and culture, first-class hotels and luxury transportation. If you have further questions or any other itinerary in mind, please don´t hesitate to contact directly either one of the undersigned. For any request and reservation please send full name of your Agency, address and number of participants expecting. Wink-Reisen will give you a deposit due date up to which time space is tentatively held. As a German member of RDA (internationaler Bustouristik Verband) we add financial protection to your security and offer a Money Protection Program in connection with one of Germany´s leading Insurance Companies. This Insurance Company will issue a fully secured and irrevocable Letter of Credit that will provide any amount of payment to WINK TRAVEL´s guests who have paid for our land package tours that do not operate in the unlikely event of bankruptcy. The Letter of Credit will cover all tours offered by WINK TRAVEL and will be sent to you prior each of your payments on request.